Daniell said discussion of the Landscape and Buffers section of the code would be part of a larger review of the entire code document. The agenda released for tomorrow night’s meeting doesn’t give any indication of what Kirouac will bring to the Board. Water Services Director Wayne Haynie will come before the Board with three requests, including to spend an additional $1 million to add a second aeration basin to the Calls Creek wastewater treatment plant now being upgraded. The second basin could be used as a reservoir for reuse water, Haynie has told County Administrator Kirouac in a Jan. 26 memo, but it also could be used as part of a future expansion of the plant from 1.5 million gallons per day to 3 million gallons per day. Williams said the goal is to create regulations that are “more user friendly and more design oriented.” The new regulations should follow “good landscape architectural practices,” he said. 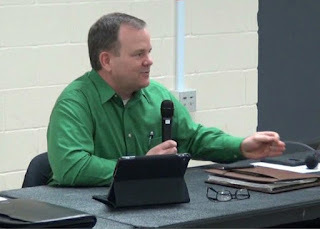 Landscape designer Bath, who lives at 2430 Snows Mill Road in the west of the county, urged the Commission at the Town Hall Meeting to take immediate action on the revisions to the landscape provisions of the Unified Development Code. In a note to the Commissioners, she argues that the new code allows for better horticultural outcomes than the current document. Crowder Construction Company of Conyers, contractor for the $13.4 million upgrade of the Calls Creek plant, has developed the design of a second aeration basin so that the structure can be used as a reservoir for a reuse water from the plant, Haynie said. At present, the county has no reuse customers, but it is contemplating pumping reuse water from the Watkinsville plant to its parks on Hog Mountain Road. “In the future, when the County contemplates expanding the plant again, AB2 would be called into service as a wastewater treatment unit, increasing the plant capacity from 1.5 to 3 MGD,” Haynie told Kirouac. Work on the plant upgrade–really a nearly full replace of the existing plant–is to be completed in August of this year, Haynie told Kirouac. The additional cost of adding the second aeration basin would be $1,030,993, and Haynie is seeking a change order in the original contract to add that amount to the contract. The county has not made any decision on upgrading the Calls Creek plant, located on the north side of Watkinsville, to 3 million gallons per day. What to do with the additional treated sewage water from such an upgrade has been a controversy in the county for the last two years. The latest proposal is to put a sewer line down Simonton Bridge Road, but that plan has not yet been approved by the Board of Commissioners. Haynie also will ask the Board to change the terms of a $1.9 million contract with Griffin Brothers Inc. of Maysville for an upgrade of the pressured sewer line from Epps Bridge Parkway at Parkway Boulevard to the Calls Creek plant. Construction is about to get underway on the 12-inch pressured line that will run under Epps Bridge Parkway at Parkway Boulevard and then follow Tanglebrook Drive to a sewer easement along a creek that links to the roadway through Pinewood Estates mobile home park. Water Service Department Director Haynie also will ask the Board to approve two separate contracts for construction of an elevated storage tank and related system improvements to serve the northwest section of the county, including the new Dove Creek Elementary School under construction on Hog Mountain Road between Osborne Road and Dewey Road near the Barrow County line. Haynie is recommending awarding a $822,080 contract to Phoenix Fabricators, of Avon, Ind., for construction of the tank and $205,500 to Allsouth Constructors, Covington, for mechanical construction work on the project. With the commissioning of this new pressure zone created by this project, the county will cease the daily water supply from Barrow County for the northwest area of Oconee County, including the Georgia Club, Haynie told Kirouac in another Jan. 26 memo. As part of an intergovernmental agreement between the county and the Oconee County School System, the school system donated property on the Dove Creek site for the water storage tank. Finally a specific landscaping code will be added. The BOC Boys and Jon Williams are in agreement so at long last we move forward in forward thinking policy. What was not pressed was the buffer regulations. Neighborhoods and the overall county would benefit from set buffers and not allow changes from BOC. Oconee has a long way to go to protect its quality of life.